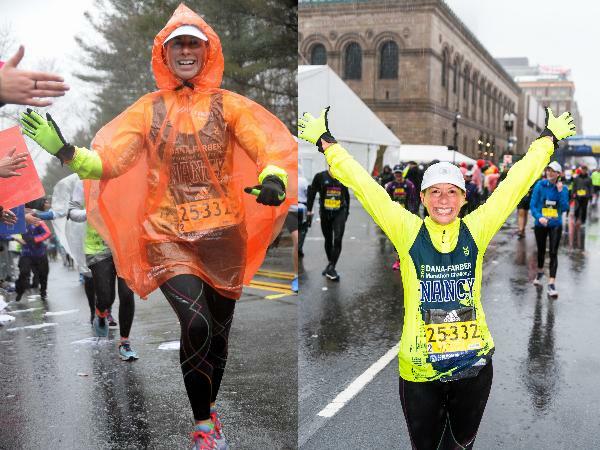 Soaking wet and elated at the finish line in 2018! ONE HUNDRED PERCENT of every dollar raised by the DFMC team supports the Claudia Adams Barr Program in Innovative Basic Cancer Research at Dana-Farber Cancer Institute!!!! These funds are fueling some of today's most promising basic cancer research. In honor of Carl Pinucci, Jesse Hall, and Jennifer Barton Hansen, and in memory of Michael Stanley. Kevin Harris - Go Nancy!! The Devines | In honor of Rose and Ellen | GOOOO NANCY!! !